Following the success of Pontins, Butlins also entered the foreign package holiday craze by acquiring the El Griego Hotel in 1983. Situated in the popular Spanish beach resort of Torremolinos the 3-star 414-room El Griego incorporated many of the popular Butlins features including British entertainment and food and of course indoor and outdoor pools. Guests were welcomed at the airport by the ever present Redcoats. 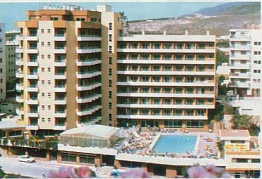 It was later sold but is still open today and is known as the El Griego Mar Hotel.